For many, the concept of financial independence means the ability to retire early, but you can desire financial independence without desiring to retire early. For some, it’s about having the comfort and security of knowing that you have enough assets to weather any unexpected disaster, such as an economic downturn, a health crisis, or a prolonged job loss. For me, being financially independent means that I can control my own time and do what interests me – that means spending more time with family and friends, and having the freedom to pursue a job that is more interesting and rewarding than my previous one, but offers less long-term security. In my case I joined a small start-up where I enjoy spending time with my co-workers and have a lot more personal autonomy. Having financial independence means knowing that if this job doesn’t work out, I’ll be okay so there’s no need to stress about it. Financial independence sounds great, right? So how do you become financially independent without inheriting a bunch of money or otherwise having some lucky event? I think Chris Reining put it most succinctly with just nine words: spend less than you earn and invest the difference. Some of you are already doing this. I’ve had some readers tell me that they’re investing more than half of their post-tax income. If you fall into this camp, you are likely still attracted to an article like this because it reinforces your worldview and affirms that you’re well on your way to financial independence if not already there. For others, this is a lot easier said than done. You may be wondering how to start – how do I start having a difference between what I earn and what I spend to invest? And even then, how do I best invest this? Behavioral economists have coined a term call the fish tank philosophy. It goes something like this: a goldfish will grow to a size suitable for its tank. The bigger the tank you provide, the bigger the fish will get. Whether this phenomenon is true or not, it’s a useful analogy to human behavior where the tank is your income and the goldfish is your spending. The more you make, the more you’re likely to spend such that it becomes harder and harder to spend less than you earn and invest the difference. As you’re spending keeps reaching or even exceeding your income (no matter how high that income gets), you now suffer from what’s often called the golden handcuffs. In order to support your high-spending lifestyle, you have no choice but to keep chugging along in growing your career at all costs, even doing something that you don’t enjoy or costing you time with friends and family. So how do you avoid falling trap to the fish tank philosophy or golden handcuffs? Make small cuts and invest those savings. Renegotiating our cell phone service. We were paying about $120/month for each of us to get unlimited talk, text, and 2GB of data each. By simply threatening to cancel to move to another carrier, we brought that down by $20 and more than doubled our data. Cutting back on restaurants and coffee. We were never big on paying for Starbucks, but have now completely eliminated buying coffee out. We also cut back on how many times we eat out for lunch during the week or go out to a restaurant or bring home takeout. Figure out how often you’re doing this now, and simply cut back just a handful of times a month. The savings will be surprisingly large. Tracking our utilities expenses and making adjustments to our HVAC settings and electricity usage to easily save 10% of our monthly costs. Re-shopping our home owners and car insurance policies every few years tends to cut that bill by over $100. Selling some unused items through local social media groups, Craigslist and eBay. If you have children this is an especially useful tool because although children can be rough on some items, many items a child uses or wears have such a short useful life that they are practically brand new. Also, in doing this, you will start to become more aware of what items you are allowing into your home, knowing that in a few short months or years you’ll either need to get rid of these items or find somewhere to store them. Being a better gatekeeper about keeping unnecessary items out of your home saves even more money than buying them now and selling them later. Utilizing our local library extensively. We routinely check out books, DVDs, and magazines from our local library, both for ourselves and for our children. We also make good use of our library’s FREE digital books and audio books, which we can “borrow” to read on our tablets, phones or computers. We no longer spend money on buying books or DVDs, movie rental fees (such as Redbox or On Demand fees) and the best part of all is that there is no clutter! When you are done, you simply return the item to the library! Then, after you’ve started making these incremental savings, it’s time to start investing these savings, which I discuss HERE. At first, you may think that making small changes and then investing your savings won’t really add up to much so why bother? But you’d be wrong to think that. As a quick example, let’s assume that you start with a few cost savings to save yourself $50 every month right off the bat – as discussed above, it doesn’t take much to squeeze $50 out of your monthly savings. And because getting started is the hardest part and you’ll start enjoying the results, I’ll bet each year you’ll be able to find at least another $10 per month to cut. 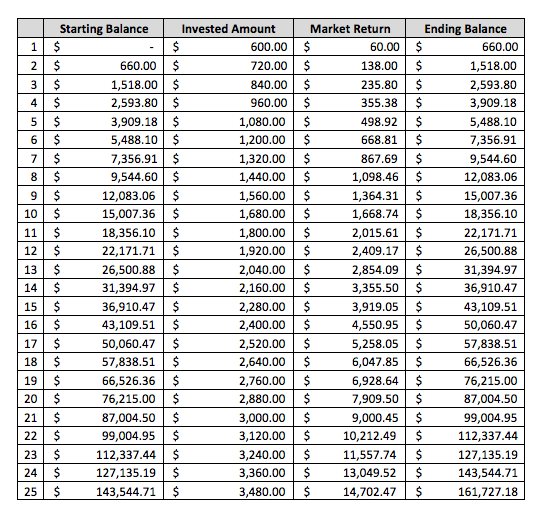 So, in the first year, at $50/month, you’ll have $600 to invest. In the second, at $60/month, you’ll have $720, and so on. Let’s say you did this for 25 years and you make an average 10% return each year on your invested savings – thanks to the power of compounding growth, by the end you’d have over $160,000. And in case you’re wondering, after 42 years, you’d break $1M. Below, I’ve included a table below showing exactly how this compounded growth looks over a 25-year period. You owe it to yourself to start making small changes today to save a little bit, and don’t put off investing those savings – this only works if you invest the cost savings. And I hope this goes without saying, but this additional investing does not preclude you from making other investments at other times of the year, or from doing a 401(k) and IRAs, etc. I’m interested in your feedback and stories in the comments section below. Please give me some concrete examples about how you’ve cut back. And please also confirm if you’ve directly invested those savings right away. You truly will be filled with a sense of accomplishment every time you set up one of these auto-invests from your saving yourself money.